Amphenol RF releases a line of 18 GHz N-Type connectors ideal for more rugged, outdoor applications that require low PIM performance. DANBURY, CONNECTICUT, UNITED STATES, March 22, 2019 /EINPresswire.com/ -- Amphenol RF is pleased to announce the expansion of the popular N-Type connector product series. The latest N-Type connectors are designed to reach an extended frequency range of 18 GHz. 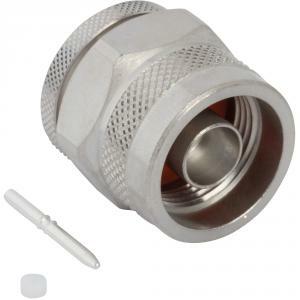 The reliable medium-sized connector features the familiar threaded coupling mechanism and provides engineers with a durable, weatherproof interconnect solution with excellent low PIM performance. The new 18 GHz N-Type connectors will offer greater design opportunities with a robust and familiar interface. The higher frequency and single body construction makes this connector appropriate for applications that require durability and faster data transfer rates. Additional features include low VSWR and insertion loss, high power handling and ruggedized construction. These interconnects are fully interchangeable with N-Type connectors made to the MIL-C-39012 specification. They are ideal for use in systems where reliable RF and mechanical performance is critical such as wireless infrastructure, military and industrial applications.